We have all probably read these words and may have acknowledged that Solomon was right when he said, “Vanity of vanity all is vanity.” “There is nothing new under the sun.” In spite of the goodness and love of God toward His creation, there seems to be no lasting purpose of the things we do. Under close examination, it is hard to avoid a profound sense of the worthlessness and vanity of all our work. We try to convince ourselves of the purpose of it all, of the reason for this constant anxiety. To what end is all of these wars and states and nations, all these elections and all this fussing, and 24 hours in a day? To what end is the process of civilization and the petty progress of the Church? If we learn anything from the Bible it is that it is always and ultimately God’s will that ends the day and that it is common knowledge that the most fundamental thing of all has already been achieved and completed in Jesus Christ. In the light of this, it is easy to understand the disgraceful refusal of men, who can neither accept the uselessness of what they have accomplished nor to accept this overruling of their fate. It is easy to understand how selfish men want to declare that they are self-made and reject any outside interference. When they survey the sciences they simply cannot see or admit that it has, in an incomprehensible degree, already been accomplished before they even arrived, to do so would be to acknowledge their nothingness and pride. Vanity of vanity all is vanity! Beginning on the sixth day of creation this vanity appears with Adam. In the Garden, Adam was asked to do what was really unnecessary because the Garden was a perfect perpetual paradise. He was asked to “till and to keep” that which was perfect. God, Himself, built perfection into this paradise, the trees already producing fruit and beautiful to look at, everything growing in abundance. 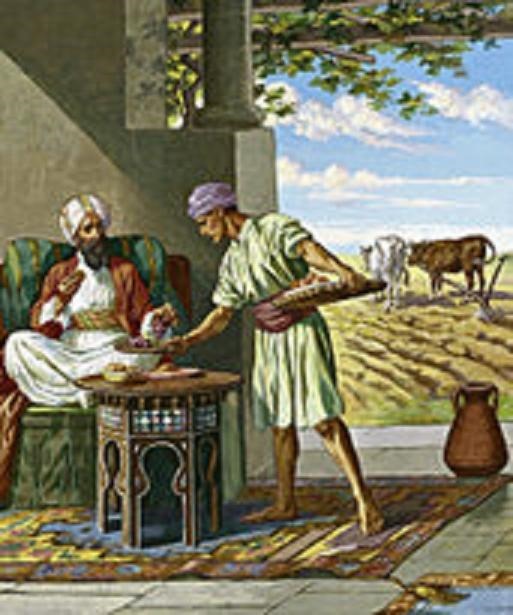 The point of tilling is either that things cannot grow without Adam’s work or that the various species needed to be improved, or that poisonous weeds needed to be controlled. Where in a perfect world is the need for tilling or cultivation? And, “keeping” the Garden, what can this possibly mean? What external threat is there where no enemy exist and everything is good? There is no disorder here because God is the God of order, here is only harmony, unity, and fellowship, the entire Garden is the reflection of its Creator who is God. Tilling and keeping only make sense in a fallen world where division, corruption, and boundaries exist, and where the relationship with the Lord has been interrupted. If we look at the Law we find the same thing. The Law is encapsulated in the Ten Commandments which describe the works we are to undertake, but to what end? The Jews understood that works were necessary for their salvation but Solomon, who typifies Christ and wisdom, described it all as vain and worthless. And, the works of faith are no different, the works of which it is said our faith is “dead” without, come up against this same vanity and uselessness. The good intentions of man and all of his efforts come up against this, that salvation is a gift involving no works at all and that all is of grace. From eternity past all has been accomplished in advance, Jesus said it is finished. It is not that we provide half and the other half is given to us, He has completed it all. Then, we come to the privilege of prayer, to speak with God as we would speak with a friend, but what do we find? Does God need to be reminded of our needs? Then what is the purpose, it appears as useless to confide our fears and desires when God knows well in advance all those things that trouble, confuse, try, and sadden us? What good is it to pray to Him for the salvation of others when He knows in advance those who will be saved? Isn’t it even said that we don’t know what we need and that the Holy Spirit intercedes on our behalf with groans? God commands us to pray and yet is it not a useless faculty? Preaching, it is the same. It is the Holy Spirit that does the real communicating who opens and closes doors; where do homiletics and eloquence come in? What part of all of this can communicate a little of the flame to others apart from God Himself doing it, and nothing is truthful or skillful but by the same means? Nothing will connect with your audience outside of the Spirit of God who blows where He wills. Paul understood that it is God alone who takes a man against his will and miraculously makes Himself known to him. All of our own words fall to the ground and are impotent and vain, it is God who is the conduit. Cannot God do all of these things quite well without men, yet, “How are they to believe in Him of whom they have never heard”? God commands us to preach, why, when it is such a useless service? Should we reject all this work? Should I be trying to convince you of this nothingness when I believe that this nothingness leads to salvation and resurrection? Should the absence of man’s understanding or of any good and purposeful work conclude that the venomous fruits of the world should necessitate their early demise? Jesus says that it is not yet time for the harvest and restrains the seventh angel, and yet to what purpose is our useless service? Now we are at the point where we will try and unravel this mystery. Now we can come to a revelation, if God so wills. Jesus has said with perfect clarity “So likewise ye, when ye shall have done all those things which are commanded you, say, We are unprofitable servants: we have done that which was our duty to do.” God has written a Book in which its contents command us to perform certain duties to the letter. The understanding and conviction of the futility of this work must not prevent us from doing as we are commanded. Our sense of the uselessness of what we must do is no excuse for inaction. When many of the characters of the Old Testament were warned by the Prophets of coming events their inaction, because of fear, futility, or unbelief, became contempt for God and His commands. It is at this point that discernment is needed. I am reminded of Naaman the Syrian who was a leper, (2 Kings 5), who was told by a little girl of Israel to go to Elisha the prophet for cleansing, and he went. Elisha without introduction or even leaving his room sends a mere messenger with instructions to simply dip seven times in the Jordan River. At these instructions, the great Naaman became enraged that Elisha did not recognize the gravity of the situation or his presence to even come out of his room and wave this arms and call down his god like the pagans and Naaman gets up to leave. Again, a servant requested him to do what Elisha has said, “what is the harm,” he said, and Naaman, the pagan warlord, was healed. It all seems so crazy, without reason, so vain. The idea here is that we are left with the freedom to do or not to do the seemingly futile, vain, and even silly things commanded us. My desire is that we would call into question all of our impulsive conclusions regarding the apparent vanity of what we are commanded to do. Yes, prayer is useless as are miracles, and our theology, and our works. The healing of Naaman had no purpose that could be observed outside of the idea that Syria would know that there was a prophet in Israel, was that all? There is a concealed dimension here that is not altogether apparent to our senses. It is exactly because of the vanity of these things and that they do not carry with them a fulfillment of our own petty goals and that they many times seem ineffective that they become, on the one hand, a testimony to the unassuming grace of God and on the other an expression of our true freedom. In the world, we are focused on usefulness, value, and necessity, and the pursuit of efficiency and these are all subject to the strictest determinations of the world of which God has no use. A necessity in the world demands results. But, the want of necessity in us is to essentially not be a true witness of this grace and freedom, the free gifts of God. If we are ready and say to ourselves that we are “unprofitable servants” then will our works truly touch on the glory of Him who freely loved us first. God loves us because He is love and not because He demands results. Fulfilling His commands are thus given a purpose and meaning other than merely achieving an objective or goal. God desires us to act out of love for having understood the blessedness of our salvation and because His Spirit willingly dwells in us, because we have received revelation, and not because we want some particular result, or even to be saved, or that others may be converted, or that America may become a Christian nation. In this way, our obedience is freed from the worry of whether or not it has been useful or effective. We “cast our bread upon the water and in many days it returns,” but it is out of our hands and the Spirit blows it where it wills, and the far future history of the world is already fulfilled while we rest, love, and obey. The gift of salvation is metaphysical as is faith, “the substance of things hoped for the evidence of things unseen”. Born again believers live in a spirit world communing with God while traveling as a pilgrim through the physical world in which we live. Our journey has to be one of constant spiritual growth. Understanding that all “is” vanity is easier when we have learned that our personal destiny and that of the world around us has been predetermined by God, nothing we do can change that. As we grow spiritually we are better able reflect God’s love to a fallen world headed to the death and fire of hell but still able to exercise free will and choose the gift of life eternal through Christ. And, paradoxically, we are exhorted to “not grow weary of doing good” (Gal. 6:9; 2 Thess. 3:13), knowing that “our labor in the Lord is not in vain” (1 Cor. 15:58). Who is adequate for these things (2 Cor. 2:16)? Only God, by His Spirit (2 Cor. 3:5-6)! Yes, David, we Christians live in a world of paradoxes: Become poor to be rich, weak to be strong, die to live, and hunger to be filled. Only the born twice (another paradox) can understand the deep mystery of the true child of God. Paul’s two years in the Arabian desert experience discovered to him the vastness of the Kingdom and the life inside. Everything was turned on its head and when he read in the Law, “thou shalt not covet” this Jew amongst Jews died, only to find himself in another world. All of his magnificent efforts to excel in the world of the Hebrews came crashing down around him and the only words left on his lips were vanity of vanity it was all in vain. This is the dark day of the soul for all of us when we discover we are nothing and all of our efforts are nothing. At this point we have choices, we can jump off a bridge in our despair, we can redouble our efforts to prove we are something, join the Church, go to seminary, wear a collar, etc., or we can bow in humility and humbleness before our Creator and Master and repeat those words of Jesus, “I am an unprofitable servant.” David knew it, Paul knew it, Peter knew, and many others knew it down through the ages, but not many know it today. This experience is the essence of what Paul spoke of in Romans 12:1 “Offer yourself as a living sacrifice”, it is the only reasonable thing to do when our eyes have been opened. Then, as you so well understand, “our labor in the Lord is not in vain.” Now, if only my little pea brain could fathom this for more than a few hours a day. All of the things we do for the Lord only stand to remind us of our gross inadequacy and I am thankful for that. I am also thankful for friends like you David. May God bless you. Thank you, Jeff, and likewise, have a great Thanksgiving.